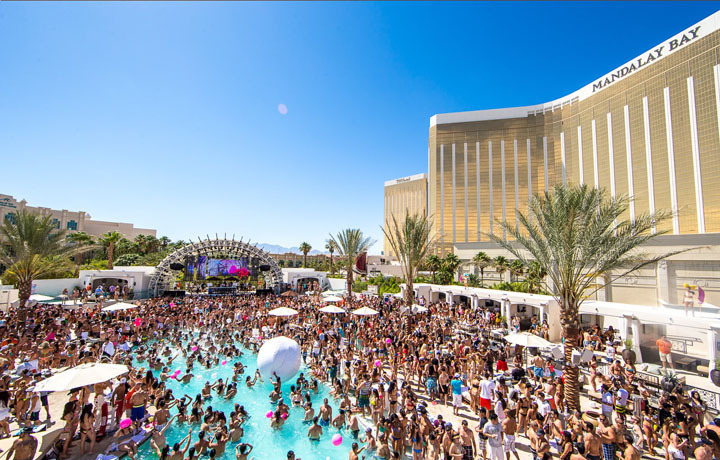 Daylight Beach Club is the 50,000 square-foot Ultra Pool at mandalay casino! Daylight is one of Vegas’ greatest dayclubs! It is massive and has a total capacity of about 5,000 people. Daylight includes a huge stage with six astonishing LED screens where Light Las Vegas‘ resident DJs will play. Some of the hottest names in electronic dance music frequent Daylight such as Disclosure, Borgeous, and Alesso! The dayclub also feature signature cocktails, and delicious cuisine including sushi and sashimi! Daylight Beach Club at Mandalay Bay was designed and created with the classy and sophisticated scene of Ibiza. Coming to daylight is like taking a little mini vacation during your vacation! You will find yourself immersed in a sunny world filled with fine cuisine and innovative technology. Despite being heavily influenced and inspired by Ibiza else doesn’t mean that this pool party isn’t 100% Sin City. Just like the nighttime property Light Nightclub, Daylight has perfectly executed the combination of classic cub atmosphere and features with exceptional design elements. Instead of creating another nightlife experience to rival clubs, Daylight has built a tropical oasis in the middle of the desert that is rivaling the finest beaches in the world, despite the lack of sandy floors. Daylight consists of various pools and plenty of daybeds and cabanas for your relaxation and the pampering you deserve! If you feel like dancing to the amazing DJs that frequent both Light and Daylight you can head to the massive stage! Even in the bright sun the six LED screens are still surprisingly functional and will leave you in awe! During the summer Daylight will even start the summer concert series on sunday nights! Daylight has an extensive food menu and fun specialty drinks including The Clooney, The Baja and, our favorite, the Daylight White Sangria. Much like everything at Mandalay Bay, its lavish details complement the everything perfectly. Daylight is a must stop on your summer vacation in Las Vegas! See also Daylight’s sister nightclub Light Nightclub. Check out our Events Calendar and see what’s happening at Daylight Pool Party Las Vegas and view the Dress Code!